Our Children’s Project is our largest project area, with over 2700 children attending our programs. 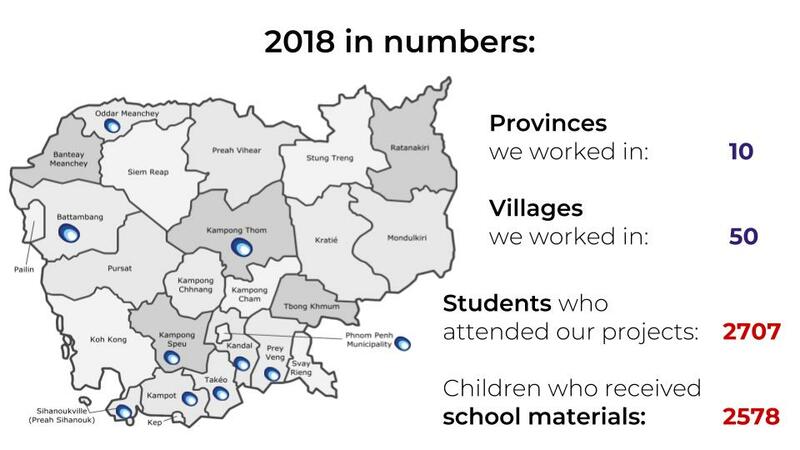 We have project sites in 50 villages, throughout 10 different Cambodian provinces. Government education in Cambodia is free. However, schools are often severely under-equipped and over-subscribed. Children do not spend the entire day in school – they attend either a morning session (7am -11am) or an afternoon session (1pm – 5pm) six days each week. This means that children only receive a maximum of 24 hours schooling per week, and actually, in reality, it is often much less than this. 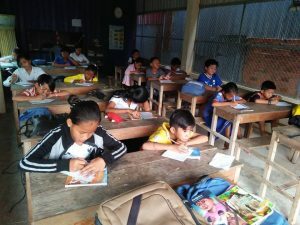 Care for Cambodia’s Children’s Projects aim to address this problem by providing supplementary education to children and provide vital school resources to the children in our projects. The philosophy of our work coheres with the advice offered by the United Nations on Sustainable Development. 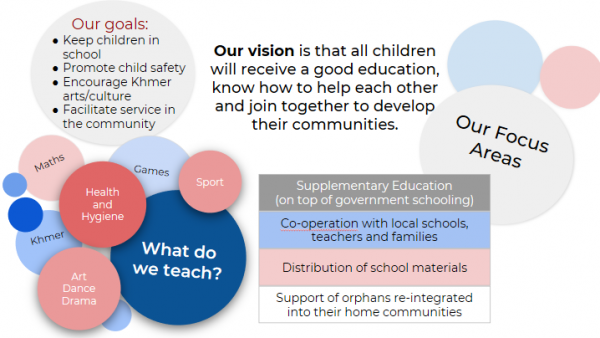 Care for Cambodia endeavors to meet this goal. Our Children’s Projects have a primary focus on education. We provide free extra-curricular education, in Khmer reading and writing, and in numeracy. Our projects run 5 days a week for 1 – 2 hours each day. Our teachers liaise with the government school teachers in an attempt to ensure that kids do not get left behind and do not drop out of school. If drop out happens then we visit the families and encourage the parents to keep their child in school. In addition to these education projects we also run sports activities, dance and drama, and craft activities for the children to offer them opportunities to explore other aspects of learning and to encourage social participation and team work. 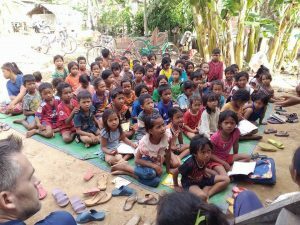 Once a year Care for Cambodia provides school materials for all children attending our projects. A school pack consists of a school bag, uniform, books, pens and pencils. These packs are personalized for each child based on gender, age, school grade and height. We have found that the provision of these school materials have been the greatest asset in our goal of keeping kids in school. The school pack is a reward for attending our project and an incentive to stay in school. Additionally, it takes away the financial burden from the family who may have to purchase these materials for several children. 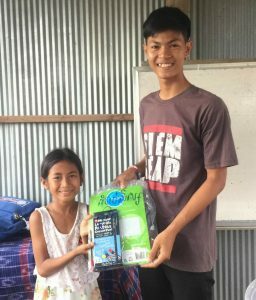 One pack costs $15, which can be a considerable outlay for a family in rural Cambodia where the average monthly income is c. $150. Our efforts are having an impact. 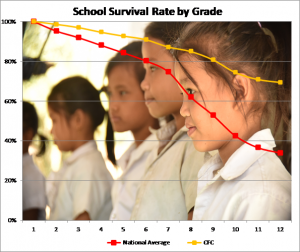 The graph below shows how the school survival rate for Care for Cambodia children is much higher than the national average. This means that we are succeeding at keeping kids in school for longer. Care for Cambodia is proud to have a majority of girls attending our projects (55% of children registered in our projects are girls). We have females in all levels of our teaching and administrative staff. We have seen girls grow up into young women who have qualified with university degrees in medicine, hospitality, tourism and management. We are immensely proud that, in a country in which women have often been under-represented, we have talented women graduating from among us. Students, male and female, are rewarded with small gifts based on their academic performance. Quality education and opportunities mean little if those in our projects suffer from poor health. Therefore we provide basic, regular care for those who attend our projects. 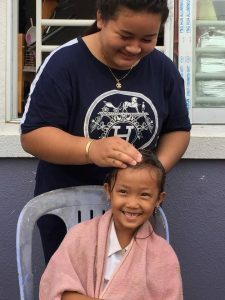 These health and hygiene sessions consist of nail cutting and shampooing hair to remove lice. 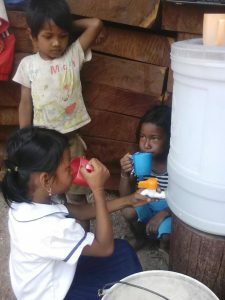 We regularly provide health and hygiene lessons and provide clean drinking water for the children at all of our project sites. 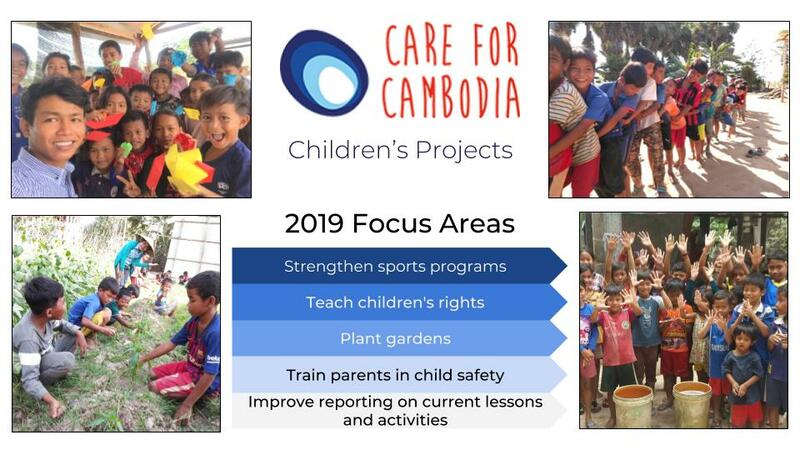 Here is an overview of what our Children’s Project will focus on in 2019.